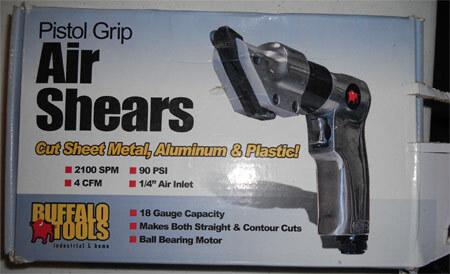 Currently viewing the category: "Buffalo"
These are the Buffalo Tools pneumatic air shears. As far as we can tell they’re supposed to cut metal and plastic. We can’t confirm this, however, since they’ve never worked out of the box and continue to be a pain in our rear. So we followed the directions and manual that came with them to get what turned out to be a broken part replaced. Pain and suffering followed. Round 1: As instructed in the booklet, we emailed the manufacturer about our broken shears. They promptly sent back word that the shears were not their product and not their problem.